Launching its "Delhi Dialogue" campaign, the Aam Aadmi Party (AAP) today launched a five-point agenda for the students and youth of Delhi in run-up to ensuing Delhi Assembly polls at Jantar Mantar where people continued to throng even till evening. As a part of its Delhi vision, the party has guaranteed higher education and announced education loan for every student in Delhi after Class XII for a period of six years, including one year for job-start and setting up of 20 new Delhi government colleges in outer Delhi in partnership with villages. The Delhi Pradesh Congress Committee, mounting its offensive against the BJP and the Aam Aadmi Party, has decided to interact with all the voters of Delhi through door-to-door visits. Delhi BJP today saw hectic political activity with party's different morchas and cells organise workers' meetings in different areas. Union Health Minister JP Nadda today visited Guru Tegh Bahadur Hospital to inspect the progress of his party-led government's "Swachhh Bharat" campaign. He also participated in the cleanliness drive of the hospital to mark "Swachhh Bharat Mission" and was joined by the Health Secretary, Special Secretary, medical superintendent and staff members of the hospital. Delhi Police Commissioner B.S. Bassi today emphasised on the need to develop traffic discipline in every citizen of the city and asked traffic policemen to start prosecuting two-wheeler riders for not wearing helmets even on residential lanes. Two non-government organizations Chintan Material Recovery Facility and Goonj win the seventh Deutsche Bank Urban Age Award 2014 in Delhi. An unidentified man in his mid-thirties was run over by a train at Mandawali railway tracks, east Delhi, today. A 36-year-old taxi driver was arrested for allegedly murdering his wife and a 22-year-old man in north-east Delhi, said a police officer today. Launching its "Delhi Dialogue" campaign, the Aam Aadmi Party (AAP) today launched a five-point agenda for the students and youth of Delhi in run-up to ensuing Delhi Assembly polls at Jantar Mantar where people continued to throng even till evening. As a part of its Delhi vision, the party has guaranteed higher education and announced education loan for every student in Delhi after Class XII for a period of six years, including one year for job-start and setting up of 20 new Delhi government colleges in outer Delhi in partnership with villages. The other big announcement was that of "Delhi Skill Mission" through which it hopes to create five-seven lakh jobs in five years and that the party, if voted to power, will fill 55,000 immediate vacancies in the Delhi government and the autonomous bodies of Government of NCT Delhi. Pointing out at the lack of infrastructure at the higher education level, AAP national convener and former Chief Minister Arvidn Kejriwal said, "Students with high scores too are not getting admissions here as no new college has been built for the past 15-20 years. Education for every child after 12 will be responsibility of the government. We will double the number of existing seats and construct 20 new colleges in Delhi." In Delhi, there are 12 government-run colleges while every year, 1.5 lakh students graduate from Class XII and a major chunk of this are left without much option, said Adarsh Shashtri, a member of the Delhi Dialogue team. AAP chief spokesperson Yogendra Yadav said the colleges will come up in the villages for which residents will give land and will also set up libraries with the help of mohalla sabhas. He challenged the BJP and the Congress to spell out their agenda for the youth. "The AAP promises people of Delhi that no children will be without education due to poverty. They do not have to mortgage their property and valuables to get education. We will roll out a loan scheme and the government will give the guarantor," he said. Skill development and income generation is another focus area of the party that has chalked out a well-thought out roadmap for the same. To bridge the skill-gap in the national Capital, the party will not only promote vocational education and skill development in schools and colleges, but also create innovative and private start up accelerators to provide support to entrepreneurs. To support the cause at the venue was present the National Skill Development Corporation chief operating officer Atul Bhatnagar. "The party will provide skill, finance and place to our youth, encourage them to start their own business and become job providers. 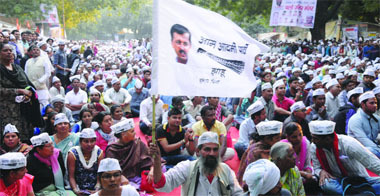 I want our youth to become job providers and not job seekers," Kejriwal said. Another party member Meera Sanyal said, "We lack a conducive system to promote innovations and the party will start with providing 30 lakh sq ft as part of the pilot test project." Through its skilling mission, the party targets to train one lakh/year for the first two years, ramped up to five lakh per year for the next three years of an AAP government. Besides, around six-seven former leaders of BSP joined the AAP. Chief spokesperson for the party and senior leader Mukesh Sharma will start a "Jan Jagran Abhiyan" by undertaking a padayatra tomorrow morning from Vipin Garden, West Delhi, to Commercial Enclave at Mohan Garden. Sharma, who began an indefinite hunger strike yesterday, demanding the roll back of the power tariff hike announced by the DERC, called off his strike this morning. Sharma said during the padayatra, he would not only make door-to-door visits to have personal interaction with the voters, but would also start a campaign to enlighten the voters about the massive development works carried out by the Congress during its 15-year rule in Delhi. He said the people would also be made aware of the failures of the AAP and the BJP, to expose the hollowness of these parties. He alleged that during the past 11 months, the all-round developments of Delhi had come to a grinding halt, and the common people were feeling let down and helpless. Hitting out at the AAP he said it had stopped talking about the Lokpal Bill. He said the AAP had promised to be a party of the common people, but now its leaders were travelling in luxury vehicles. Party's pradesh in charge Prabhat Jha said in the ongoing membership campaign and ensuing election party's district units and various morchas, cells hold the key to join masses to the party. He called upon the workers to go amongst the people and spread the message of good works of the Centre. Speaking at a meeting in Mayur Vihar, Delhi BJP president Satish Upadhyay called upon the workers to take up the challenge to revive the party and win at least three out of the five constituencies in the assembly elections. He said, "In 2013 assembly elections we missed by just four seats and I feel that with little hard work party could have retained Trilokpuri and added Kondali. Six teams comprising doctors, nurses, other healthcare workers and administrative staff participated in the drive on the hospital premises and the perimeter of the hospital. The Health Minister participated in the cleaning of the open area in front of OPD gate and hospital corridor. Nadda, who was also briefed about the procedure for maintenance of bio-medical waste, also visited the autoclaving plant used for treating the biomedical waste. He issued directions for improving this area in a time-bound manner. The minister was apprised of the maternal and child care activities and specialized services being provided by diabetic, endocrine, and metabolic centre. He inspected the hospital kitchen and witnessed the preparation of breakfast and lunch. The minister acknowledged the initiatives and efforts of the health department with massive cleanliness drive under "Swachh Bharat Misson" and emphasised the importance of campaign conceived by Prime Minister Narendra Modi. Bassi was speaking at the inauguration of the Road Safety Pavilion of Delhi Traffic Police at the India International Trade Fair at Pragati Maidan here today. "Traffic is the prime issue which the public has to face in their daily life. Every citizen, including children, is affected by this. There is a need to develop traffic discipline in each and every residents of the city," he said. He emphasised on prosecution of traffic violators and stressed that 2015 should be the year of quality prosecution. "Traffic violations such as disobeying stop-line, jumping red lights, etc., should be given special attention. Traffic policemen need to check and prosecute two-wheelers drivers/ pillion riders for not wearing helmets on residential streets itself, so that nobody can come on road without wearing helmet. Also helmet should be properly strapped to avoid any mishap," he said. The inauguration was attended by senior officers of the Delhi Police, Traffic Police officers and 220 schoolchildren from different schools. This year the theme of the Traffic Pavilion is "Caution & Care Make Accidents Rare". The two projects were chosen by an independent jury from a pool of 135 entries and a list of nine finalists. The jury chose the two projects in order to emphasise the importance of more sustainable cycles of consumption and production and for thinking creatively about locating workplaces and employment opportunities in cities. The Chintan Material Recovery Facility project at New Delhi Railway Station manages tonnes of unsorted garbage from the numerous trains that arrive at the railway station every day. The garbage, which would otherwise end up in landfill dumps outside the city, is sorted into organic and non-organic waste by trained workers at the centre. The organic waste is then composted into manure through micro-composting and the non-organic waste is systematically sorted into various recyclable components, and as a result only 20 per cent ends up in landfills. The project arose from a partnership between Chintan, Safai Sena (an association of waste-pickers) and New Delhi Railway Station. Goonj, formed in 1999, works on issues of urban waste and social distribution. Its mission is to reuse vast quantities of untapped old and waste material in middle-class households to create second-hand products. Eyewitnesses told the police that the man was crossing the railway tracks with earphones plugged in his ears when the incident took place. The police, however, have not found a mobile phone or the earplugs from the spot. The police were informed about the incident at about 10.30 am. An eyewitness told the police that a man's scream could be heard and after the train passed by his body was found near the tracks. The man had died on the spot. "We searched his pockets and the area around his body, but could not find anything, not even a document which could establish his identity," said a police officer. The victims have been identified as Savita (36) and Akash (22), who was a BSc. The accused, Arun Chauhan, is Savita's husband and works as a taxi driver, according to the police. The police were informed about the incident about 7.30 am today. The police officer said Arun allegedly strangled Savita at their home at C-Block, Ganga Vihar. He then allegedly stabbed Akash multiple times. "Savita's body was found at her home. Arun said he had taken Akash to search for his children. Akash's body was found near a crematorium located behind Bhim Rao Ambedkar College at Main Wazirabad Road near Gokulpuri," said the officer. Savita and Arun have two children, a 14-year-old boy and a 10-year-old girl. The police are questioning Arun and are trying to ascertain the motive behind the murder. "It could be financial problems or a relationship between Savita and Akash. We are probing both the angles in connection with the murder," said the officer, adding that the couple were acquainted with Akash.